Our museum is adapted for all categories of disabled visitors. The museum is equipped with ramps (including portable), lifts, and recreation areas. There are specially equipped toilets with changing tables for babies on the ground floor of the main building and the 1st floor of the exhibition complex. Two cafes on the ground floors of both buildings offer not only a good lunch but also a variety of coffee and delicious desserts. The parking spaces for disabled are specially indicated. The disabled persons of I and II groups are served out of turn. The exhibitions held at the State Darwin Museum are accessible for all categories of disabled people. Each year the museum provides exhibition spaces for creative works of people with various disabilities. Most exhibitions include master-classes available for the disabled of different categories. Some of the master-classes are given by the disabled experts. Educational services have been offered at the State Darwin Museum for over 80 years. The founder and the first director of the Darwin museum Alexander Fedorovich Kohts gave many guided tours for blind students since mid 1920es. 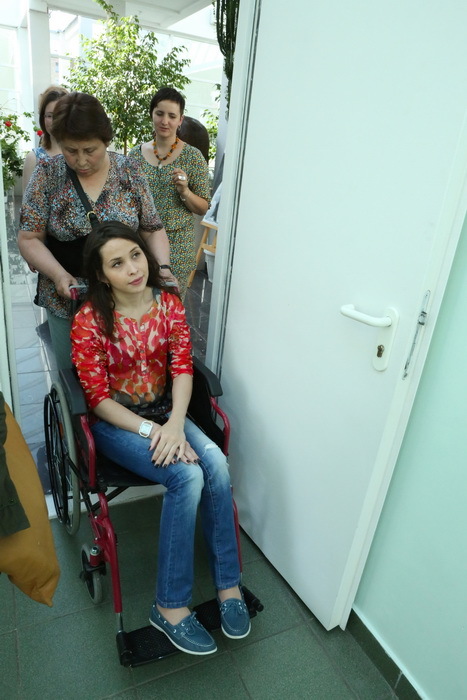 During the Great Patriotic War, the museum was visited by different groups of injured and disabled people. The director A.F. Kohts often worked with them personally. 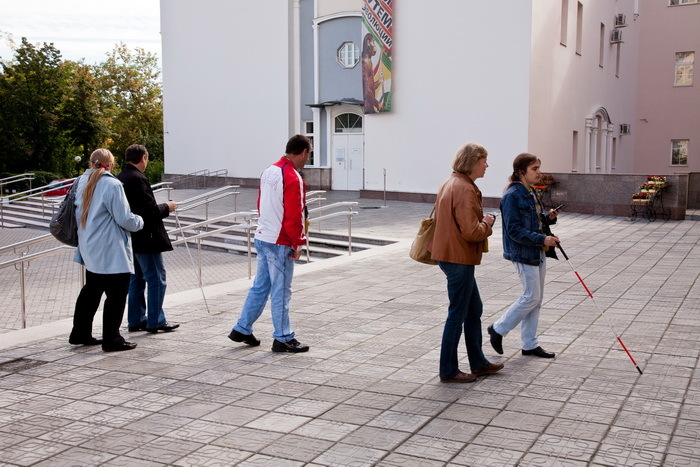 Currently, the Museum regularly receives visitors with various forms of disability: - Mobility impairment - Hearing-impaired - Blind and visually Impaired - Intellectual disability and autismThe director of the museum Anna Iosifovna Kliukina gives a guided tour for the disabled visitors. The director of the Russian disability non-governmental organization (NGO) “Perspektiva” Denis Rosa (in the centre) and the disabled visitors: Natalia Prisetskaya and Valeriy Shkolnikov.The Darwin museum is especially equipped for disabled visitors. 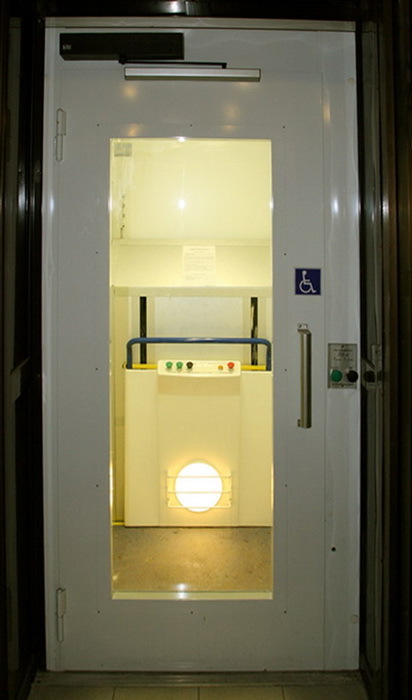 If necessary, the museum staff will assist you.There is a special lift for visitors with mobility impairment and an especially equipped toilet of a larger size.A special route around the exposition was devised for blind visitors; the route includes tactile study of sculptures and reconstructions of ancient people and extinct animals. A number of exhibits was selected for tactile study of the blind. These items reflect the funds of the Museum, including the ones on display or inaccessible to public: invertebrates, bones, stuffed birds and animals, pieces of fur of various mammals.A number of exhibits was selected for tactile study of the blind. 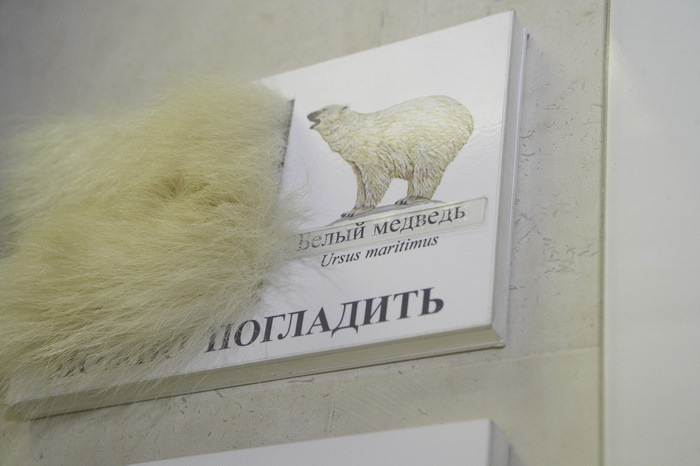 These items reflect the funds of the Museum, including the ones on display or inaccessible to public: invertebrates, bones, stuffed birds and animals, pieces of fur of various mammals.The State Duma Deputy O.N. Smolin, visually disabled of the 1 group, examines a stuffed pangolin.Mr. Colin Low, the President of the European Blind Union, examines the stuffed owl. The museum regularly hosts exhibitions, presenting the works of artists with disabilities and children with autism and delayed development. 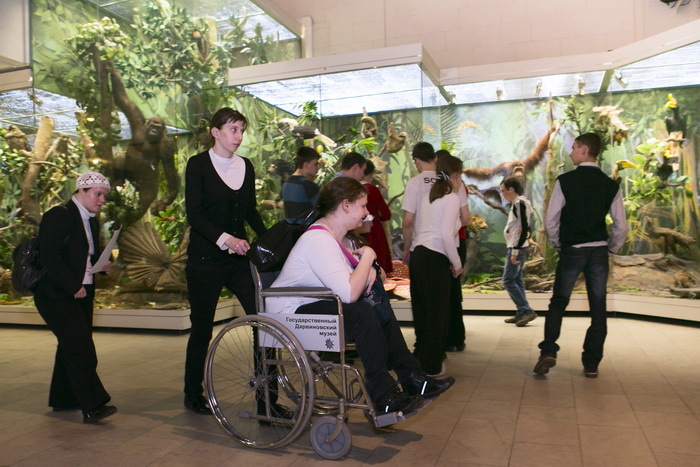 The achievements of the museum in the field of creating a comfortable environment for disabled persons was marked at the “REHA-2003” exhibitions in Düsseldorf (Germany), and at the Sokolniki exhibition complex in Moscow (the “Invatekh-2003”, “REHATECH-2005” events). The museum developed and holds interactive classes for children and adult audiences.«Our six-legged planet neighbours»An interactive class in the museum’s insectariumThe class opens the wonderful and diverse world of insects. Large bright beetles and tropical butterflies. Inhabitants of our parks, gardens, forests and meadows. Rare and protected species. Live insects including cockroaches, stick insects, grasshoppers, crickets, and other kinds. Members of the class can hold them in hands.Animals and birds of RussiaAn interactive class in the exposition The class teaches about typical representatives of the animal world in Russia, and characteristics of Russian natural areas. This activity continues and complements the topics of standard school lessons (for example, biology and geography). The planet of plantsAn interactive class held in the museum’s greenhouse and the environmental path area. The disabled persons of all categories can participate in all public events held by the State Darwin Museum. 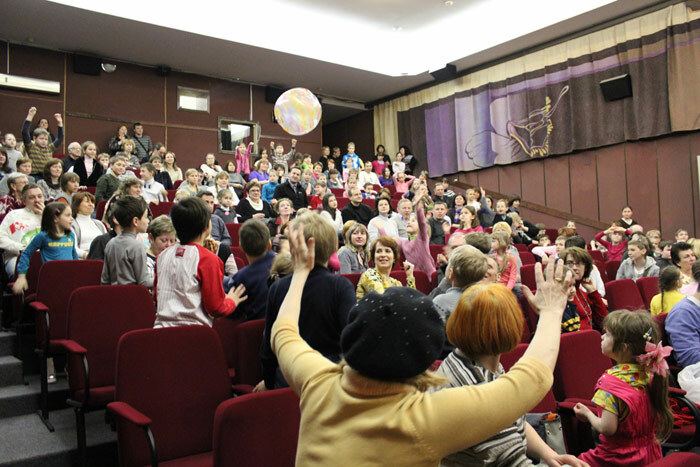 Such events usually include creative and educational contests of varying difficulty, games, master-classes, concerts, film screenings and performances. The staff of the State Darwin Museum will gratefully consider any suggestions that would improve the visit of persons with disabilities of different categories. 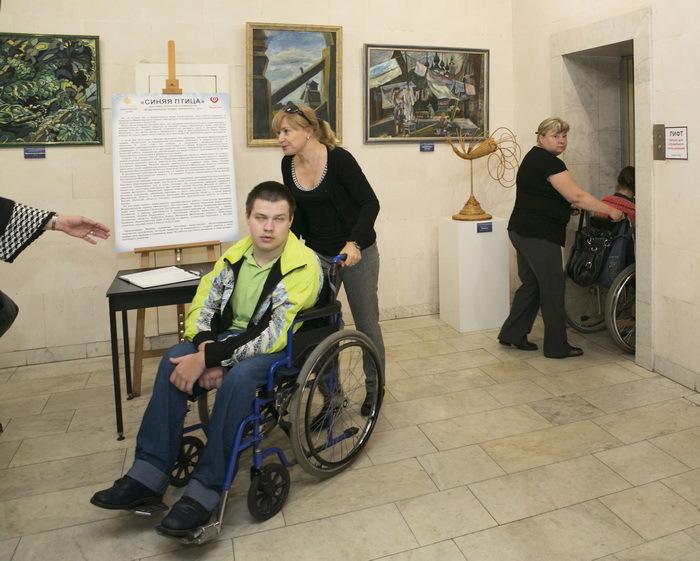 “Museum without barriers” The program is devised for disabled visitors of all categories. 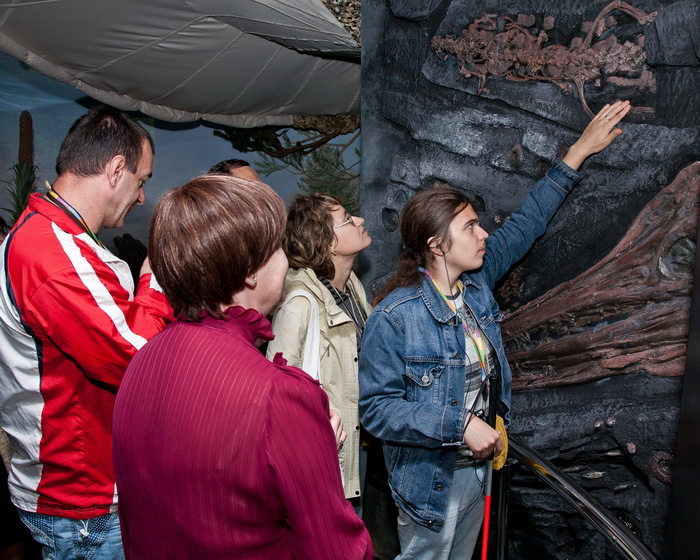 It includes exploring the main exposition of the museum as well as interactive centers “Cognize yourself – Discover the world”, “Walk the Path of Evolution”, guided tours and interactive classes“Special visitors” The program is developed for visitors with autism and members of their families. “The world in hands” Educational activities and interactive classes for deaf-blind and visually impaired visitors. The project is implemented with the support of the Non-state establishment “Institute of professional rehabilitation and personnel training of the all-Russian public organization of disabled people – the all-Russian Order of the Red Banner of Labour of the society of the blind “Rehacomp”. Disability should be considered as a part of human life and regarded with an adequate respect, care and attention to the disabled part of population. The main idea of service provided for the disabled in the Darwin museum is creating a comfortable environment for visitors with disabilities to enjoy the process of exploring the beautiful world and taking part in various educational activities and events held at the museum. The museum offers adapted guided tours for disabled persons of all categories, including visitors with combined pathologies (children and adult audiences). 1. Specialised excursions and classes for visitors with disorders of mental development and particular characteristics of emotional response. A special program is devised to meet individual needs of each group. 2. 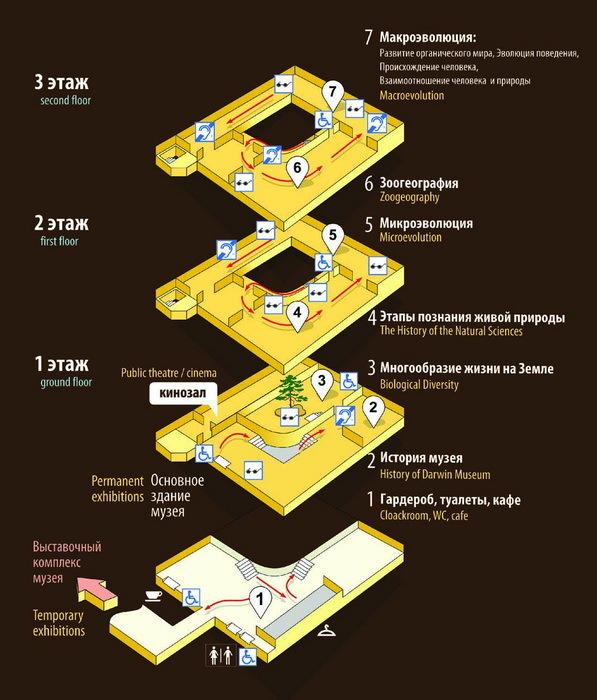 A comfortable route around the exposition is prepared for visitors with mobility impairments. 3. General and thematic excursions around the main exposition and classes for blind, visually impaired and deaf-blind visitors are conducted using the tactile didactic material. 4. There are services of an interpreter for visitors with hearing impairment available during guided tours and classes. A guided tour for visitors with autism.A quest at the temporary exhibition “Birds. Technology of perfection”. An interactive class with insects in the museum’s insectariumA general excursion around the main exposition Thematic tours “Wonderful world of the planet Earth” A colourful variety of the animal world on our planet including inhabitants of tropical forests, savannas, highlands, seas and oceans as well as visible and invisible connections between them.“Predators” Typical characteristics of predators, specialised orders, hunting tactics, characteristics of individual representatives living in different places on Earth.“Six-legged planet neighbours” This activity opens the wonderful and diverse world of insects. Large bright beetles and tropical butterflies. Inhabitants of our parks, gardens, forests and meadows. Rare and protected species. Live insects including cockroaches, stick insects, grasshoppers, crickets, and other kinds. Members of the class can hold them in hands.“The world of plants” The world of plants is not less diverse than the world of animals. An extraordinary beauty of a flower and unusual shape of leaves, roots and stems often imply particular means of survival in a natural community. A guided tour around a wonderful greenhouse of the museum will reveal for you the secrets and mysteries of plants. “Environmental Path” This activity includes exploring inhabitants of the modern metropolis (animals, plants, mushrooms).